Which were the first two teams to play in the Super Bowl? The first Super Bowl was held at the Los Angeles Memorial Coliseum on January 15, 1967. The Green Bay Packers led by QB Bart Starr, defeated the Kansas City Chiefs 35-10. The earliest mention of dominoes is from Yuan Dynasty China, although it is unknown how Chinese dominoes developed into the modern game. It is speculated that Italian missionaries in China may have brought the game to Europe. Who was the first woman to win the Iditarod four times? Susan Howlet Butcher an American dog musher is the second woman to ever win the Iditarod Trail Sled Dog Race in 1986. She is also the first woman and the second four-time winner in 1990. She won four out of five sequential years. In American Football, after a safety, what does the team who was scored against have to do? A safety is when you are tackled in your own endzone. The team that was scored again must punt the ball to the scoring team. Which Major League Baseball team has won the most World-series of all-time? The New York Yankees have won a total of 26 World-Series. What did National Hockey League (NHL) players use back in the day, before the hockey puck was invented? Before the hockey puck was invented, players would shoot frozen cow dung patties over the local frozen pond or lake. 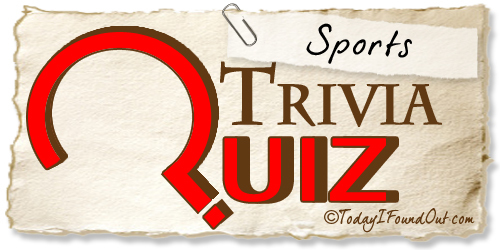 Which TV personality has two gold medals for swimming at the Olympics? Summer Sanders won at the 1992 Summer Olympics in Barcelona, Spain, she won gold medals in the 200-meter butterfly and in the 400-meter medley relay. Who was the youngest man to ever win a men's singles champion at Wimbledon? Boris Becker (Germany) won the first of his three titles in 1985 at the age of 17 years and 227 days, making him the youngest-ever winner of the men's singles title at Wimbledon. Name the MLB team that has never made it to the World Series? Established back in 1977 the Seattle Mariners are one of the only teams that has never made it to a World Series. The national sport of Afghanistan, Buzkashi involves propelling what object toward a goal? Buzkashi is often compared to polo. Both games are played between people on horseback, both involve propelling an object toward a goal, and both get fairly rough. However, polo is played with a ball, and buzkashi is played with a headless goat carcass. The RSS feed for these quizzes includes the answers. Thought you might like to know. @Lloyd: Sacrebleu! That’s good to know!